The common cold and flu are common illness during winter. These can be managed by symptomatic treatment as well as certain medications. But symptoms of cold are generally milder than flu symptoms. There are many viruses that cause a cold but flu is caused by rhinovirus. 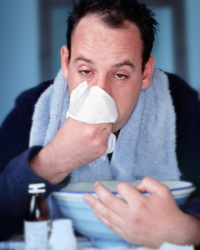 The common cold and flu are common illness which causes people to miss work or school. They are usually self-limited contagious illness caused by differen types of virus. These are medically referred to as a viral upper respiratory tract infection. Symptoms of the common cold and flu are very similar and may include cough, sore throat, nasal congestion, runny nose, and sneezing. But symptoms of cold are generally milder than flu symptoms and flu tends to have a rapid onset of symptoms. There are several different types of viruses (>200 types) which can cause common cold. But rhinovirus is the commonest cause and it causes about 30%-35% of all adult colds. Other viruses which commonly cause cold are coronavirus, adenovirus, respiratory syncytial virus, and parainfluenza virus. The flu (influenza) is caused by three types of influenza virus; types A, B, and C.
Common colds occur recurrently as there are so many viruses which can cause a cold, so the body never develops resistance against all of them. Also people don’t develop resistance to flu as the flu virus changes form frequently. According to experts children in preschool and elementary school can experience six to 12 colds per year and adolescents and adults usually have two to four colds per year. What is the Treatment for Cold and Flu?